The Intensive Care Unit of Saint Joseph´s Catholic Hospital was opened in the beginning of June, 2012. To mark this occasion, the Hospital held a training course called Fundamentals in Intensive Care Medicine, with Dr. Javier Maynar, intensivist from the University Hospital of Alava, Spain, and Nagore Martínez de Aguirre, ICU nurse from the same hospital. To train our staff in the management of specially complex patients. To give specific training in CPR (cardiopulmonary resuscitation). To collaborate in the improvement of Liberian professionals and students´ competence giving them the opportunityto to receive quality training. Operating theatre and perioperative care are growing in knowledge and technology. The appropriate continuation of care implies the organization of an adapted perioperative care, which must be proportional to each clinical scenario. In this field, intensive care medicine offers the philosophy and the knowledge to implement clinical assistance from the common perioperative care to the more critical care. Nurses and doctors need to work developing common protocols. Critical care medicine needs to be involved in the global quality policy of the hospital and requires the implication of all the specialists who work in the facility. Every physician is able to collaborate in an specific level. This course, held from May 30th to June 8th, collaborated in spreading the continuous care culture from the “patient at risk” to the “critically ill patient” among doctosr and nurses. To review general managing and supportive care of the critically ill patient: nurse and medical based. To approach to acute illness. To understand new monitoring, measurements and interpretation of data. To learn Cardiopulmonary Resuscitation (CPR). To review and to develop technical skills. Workshops: cardiopulmonary resuscitation (CPR), hemodynamic, mechanical ventilation, RRT, vascular access, airway, nasogastric tube insertion, bladder catheterization, venepuncture procedure for maintenance of vascular access. 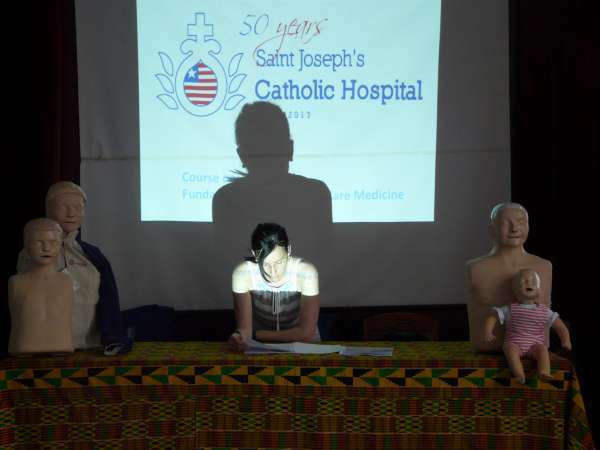 Hands on patient: practice with real scenarios at the ICU. 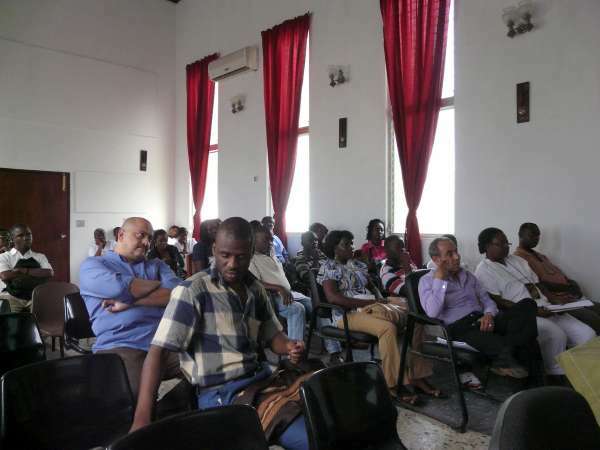 From: Saint Joseph´s Catholic Hospital, Redemption Hospital, Phebe Hospital, Red Cross, United Nations, A. M. Dogliotti School of Medicine (University of Liberia) and Mother Patern School of Health Sciences (Stella Maris Polythecnic). 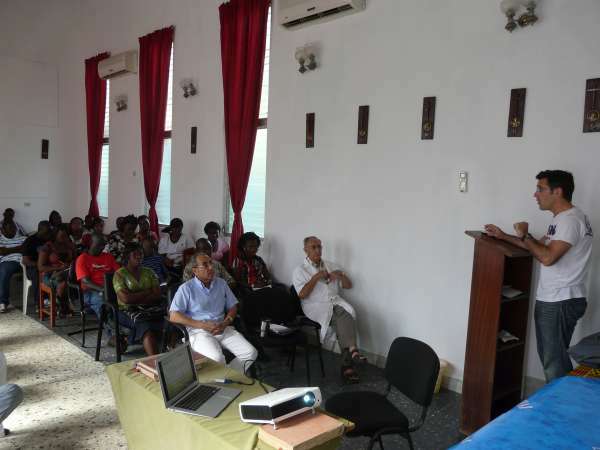 Dr. Javier Maynar, during one of his lectures (Photo: M. Tellaeche). 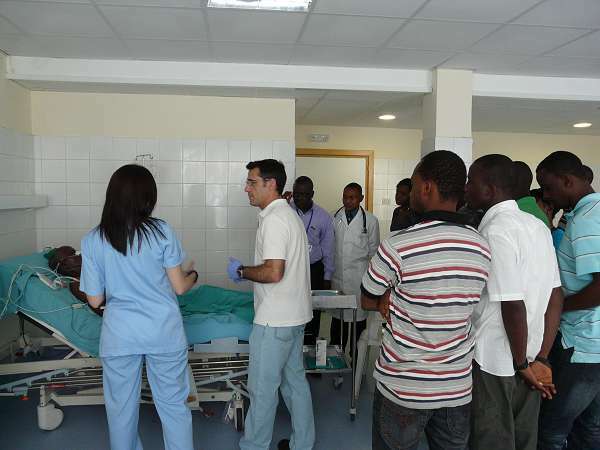 Dr. Javier Maynar and nurse Nagore Martínez, giving part of the training course at the ICU area (Photo: M. Tellaeche). 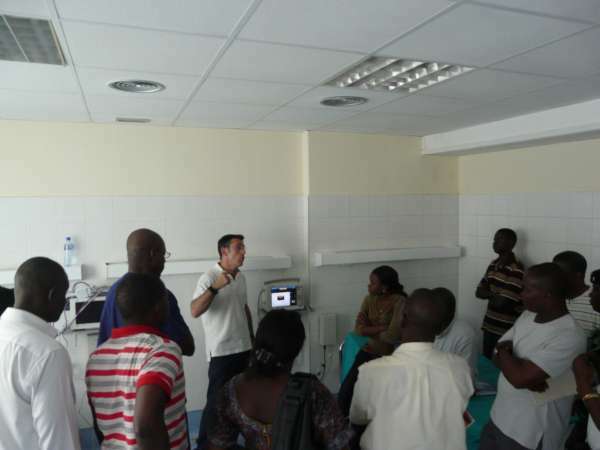 Dr. Javier Maynar at the ICU area with some trainees (Photo: M. Tellaeche). 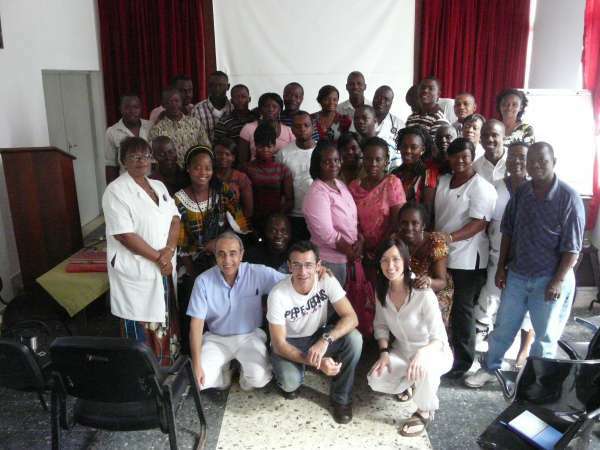 The whole group of attendees to the Intensive Care Medicine course (Photo: M. Tellaeche).